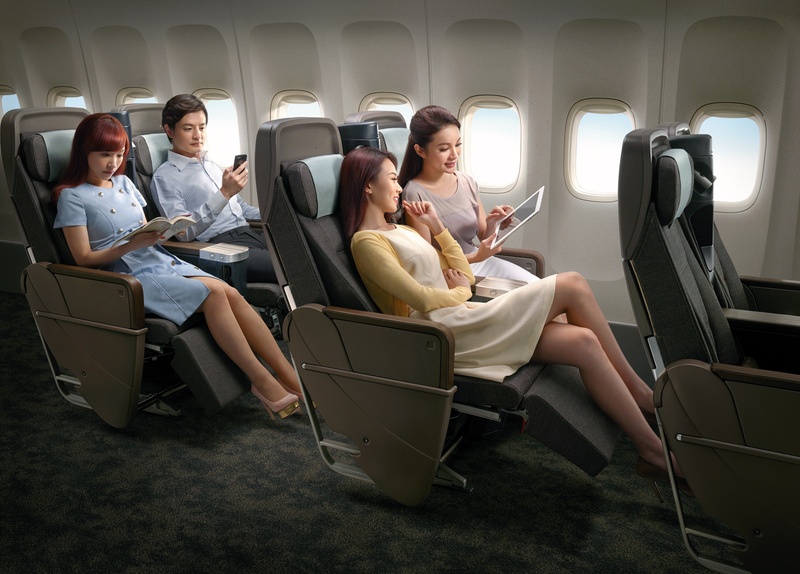 Whilst it’s easy to pick their new ‘Premium Business Class’ product as the true flagship product on the new aircraft, we are also torn by their brand new premium economy class, which is phenomenal in its own right. Let’s start with the business class cabin. 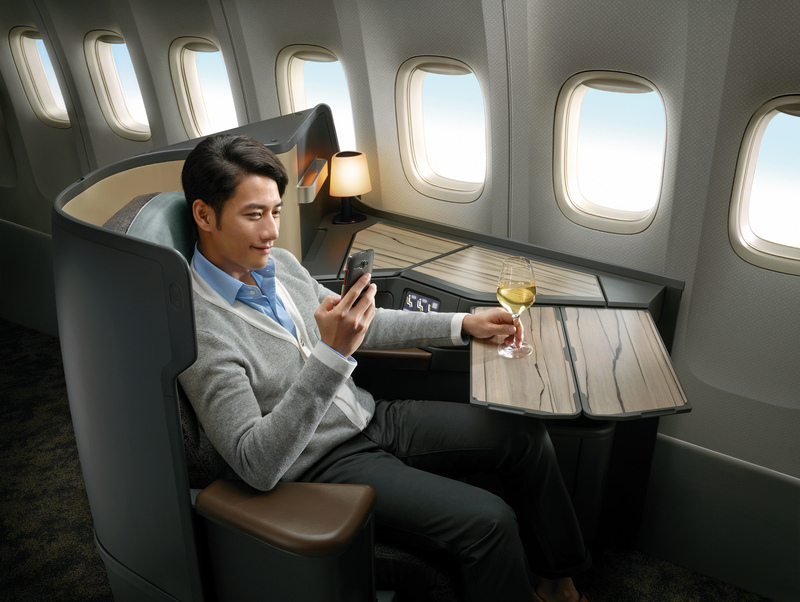 China Airlines new business class on first impressions is incredibly smart. The entrance way utilises the new ceiling design from Boeing, with flowing arched ceiling panel with mood lighting giving a sense of height. The entrance way is surrounded by an iconic and instantly recognisable wooden veneer. Situated in the galley is the ‘Sky Lounge’, an area dedicated to allow business class passengers to meet up pick up a book from their onboard library (lo-fi chic!) and have a drink at the stand-up bar. It’s not a full bar per-se, but still a welcome gathering area in the centre of the business class cabin. The wooden veneer also continues through the rest of the aircraft, with bulkheads and toilets featuring the same finish. In the business class cabin the veneer becomes second to the colours and textures found in their brand new flatbed business class seats – a first for the carrier, who originally only provided flat beds to their First Class passengers, a cabin class (only found in selected 747s) that is being phased out over the coming years. 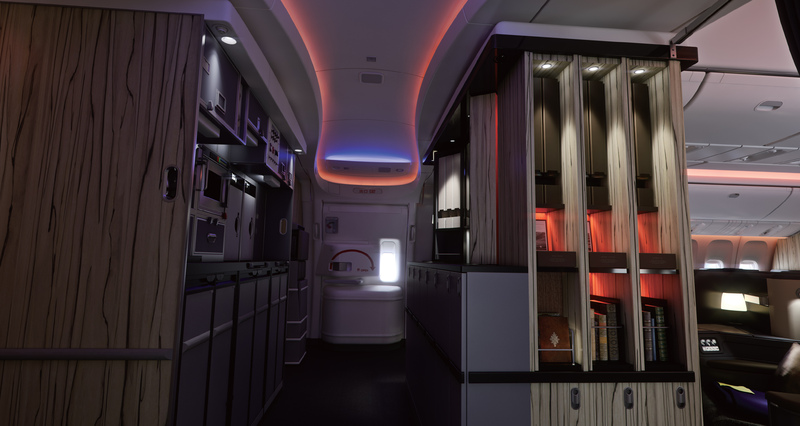 The Business Class cabin is separated into two sections, in a 1 x 2 x 1 seating configuration, the forward of the two cabins offering 6 rows in the front, and a further 4 rows in the secondary cabin behind the entrance door. 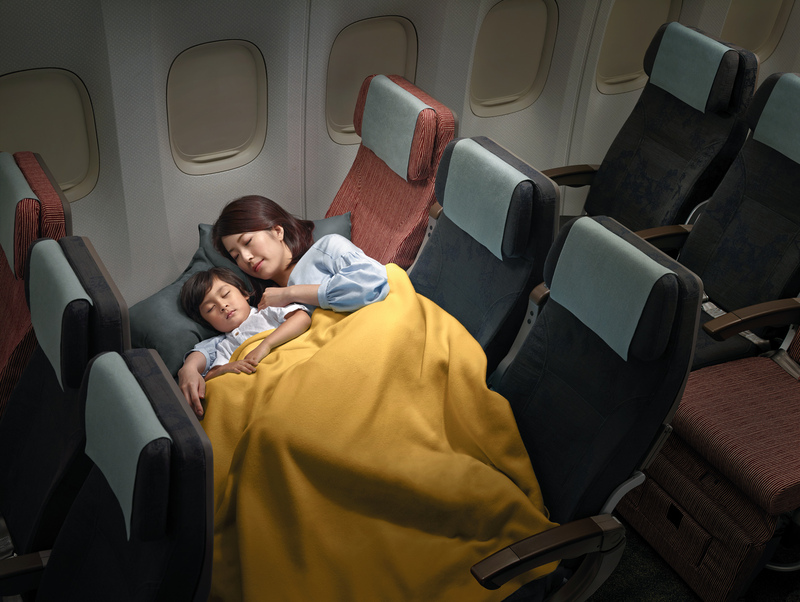 All the seats offer aisle access and 78 inches of bed length and 28 inches of seat width (when flat) and a comfortable memory foam seat pad to help offer comfort in both seat and bed mode. 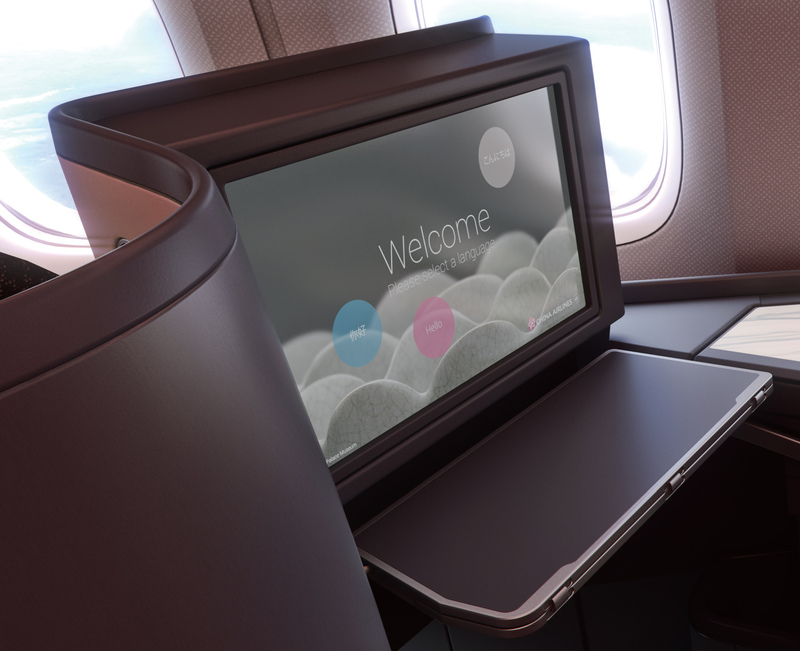 Facing forward, a fleet of 18 inch touchscreen monitors (the largest screen on Taiwanese carriers) offer a wealth of on-demand entertainment with a clean and contemporary user interface including a seat chat function, allowing you to write to passengers in other seats. The seats naturally are awash with storage cubby-holes, and surfaces to either work or store your personal devices, giving ample space to eat and drink, even when working on a laptop, utilising the aircraft’s onboard Wi-Fi. We like the finishes utilised here, and whilst the wooden veneer is a very strong visual cue, it helps differentiate the China Airlines cabin from their competitors that use the same seat hard product. The small touches like the seat lamp, similar in design to that used by Air France, mean the cabin has a warm, residential feel. 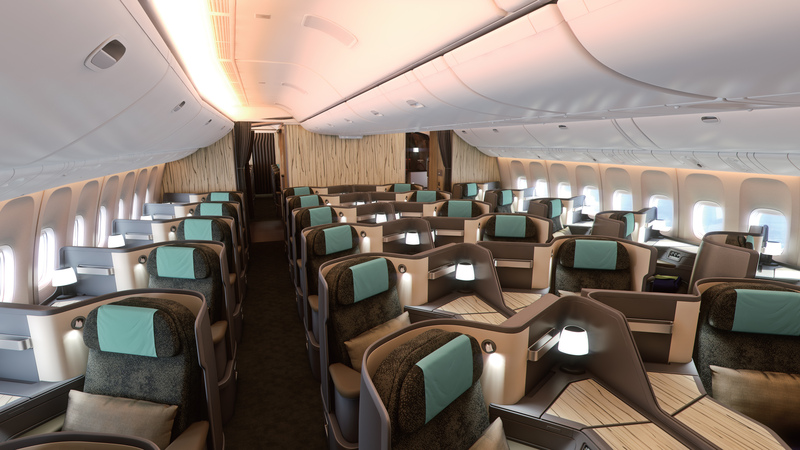 When compared to the softer more pastel colours of their previous business class cabin, this is a much stronger visual look, much more considered, and contemporary. It certainly should last the test of time. Fingers crossed the cabin gets rolled out through the rest of their fleet soon. 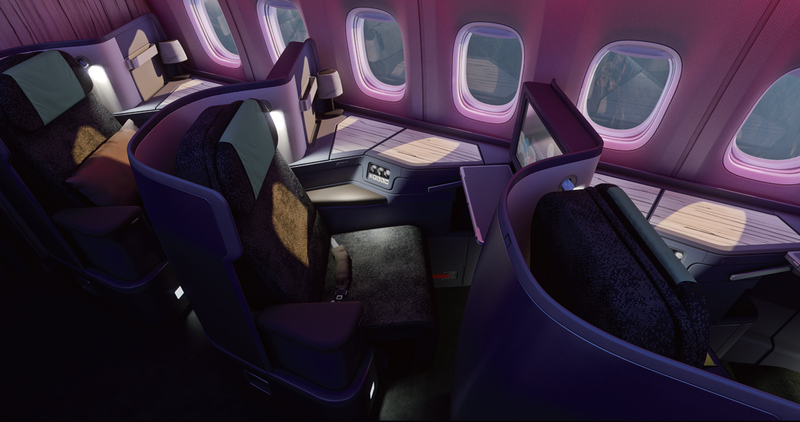 When we announced the new cabins from China Airlines we didn’t have much information on the new Premium Economy cabin, a first for this carrier. The cabin is certainly at the very top of the airline industry for its offering, with regards to seat comfort and space. With over 39 inches seat pitch and 19 inch seat width, the 62 seats situated behind the business class cabin are arranged in a 2 x 4 x 2 configuration. In a considered move, the airline opted for fixed seat backs (to stop the need for knee defenders) meaning that passengers as they recline don’t invade the space of the passenger behind. 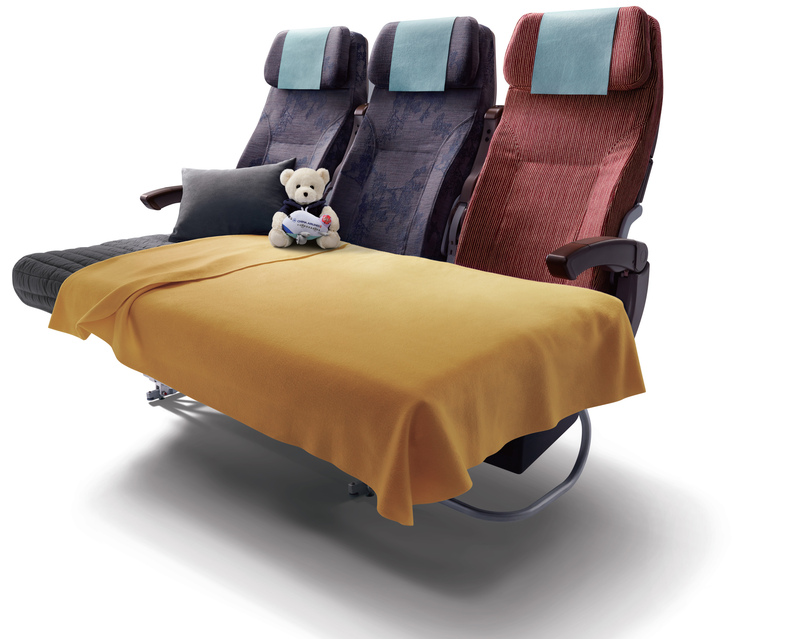 Usually the hard shell products with sliding seat bases mean the seat loses some of its comfort, however, with the addition of the leg rest the passenger is cradled, offering extra support for overnight flights and those in need of a good nights rest. 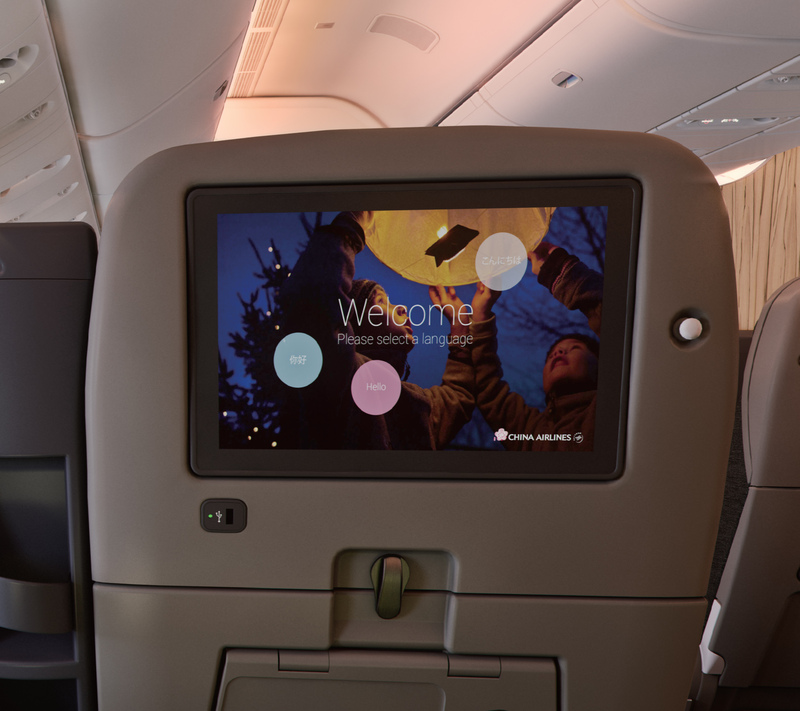 Also a leading element to this premium economy product, is their huge 12.1 inch IFE touchscreen and hand-held controller. We love the deep charcoal and moss colours used in the cabin, that add a sophisticated touch to the space. Each seat is equipped with a personal reading light, and storage space between each seat as well as a small divider which offers increased privacy. The seats are also equipped with power sockets and USB ports, and access to WiFi means that all passengers are connected. A nice touch is the table within a table, meaning that just drinks and snacks can be placed on a smaller table below the screen, without having to utilise the larger table, again increasing passenger space and comfort. 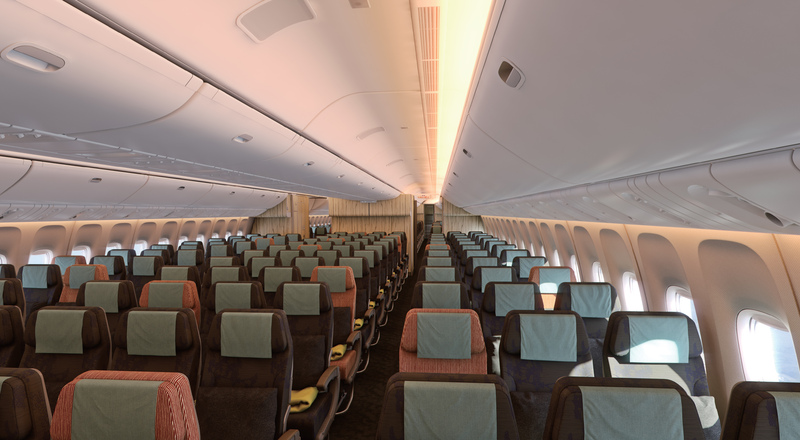 The economy class section, split in two areas feature brand new economy class seats, and with the new ceiling bins, space is at a maximum, the seats in a 3 x 4 x 3 seating configuration (In a similar move to both American and Air Canada) meaning the seat width is a little tighter than before (17″), but feature a large 11.1 inch touchscreen TV meaning you’ll quickly forget about the seat width, being immersed in top quality programming, wifi and seat chat. There is even USB ports for charging and power sockets too at every seat. 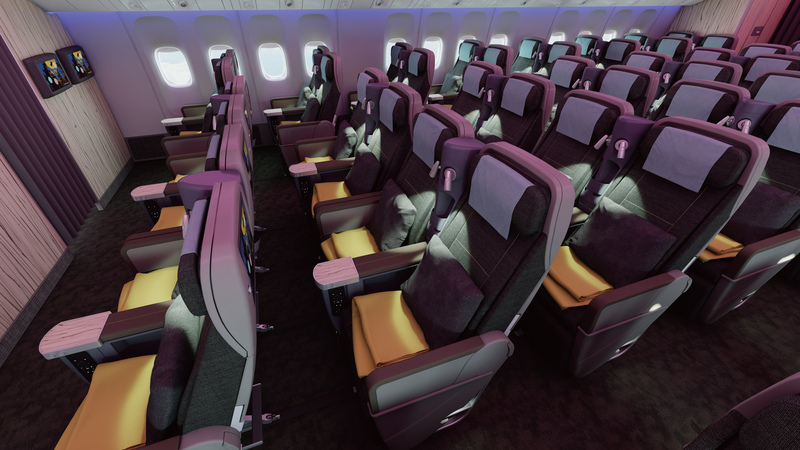 The sea of seats, in the specially designed China Airlines graphic are broken up by occasional and randomly placed striped red seats to help make the space feel more intimate, in a similar move to that of Royal Jordanian who recently revealed their new 787. 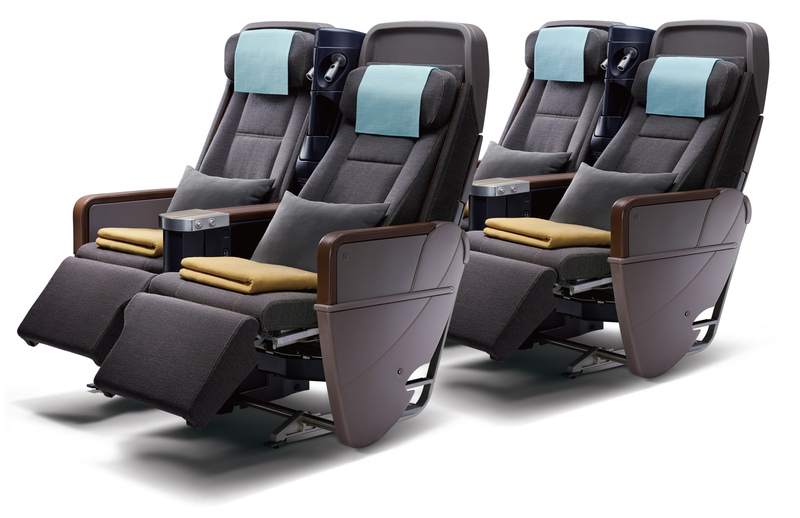 Situated on the right hand side of the aircraft, in the first section of seats (41-51H,J,K) are an adaptation of Air New Zealand’s SkyCouch, dubbed ‘Family couch.’ The slimline seats (which offer greater seat pitch – of 32″) can be turned into a fully responsive flatbed, which whilst a little bit on the short side, can fit a passenger and two kids comfortably, or two adults who are willing to spoon, at a fraction of the price of the equivalent in business class. The seats are comfortable, and armrests can fully retract meaning that passengers flying in pairs can prop each other up on just two seats, a nifty design solution to a bug-bear we have had with many economy seats in the past. We have to say at thedesignair.net we are impressed by the overall product, especially in business, which in comparison to the already pretty darn good current product, is a huge leap forward, potentially setting it in the same category as airlines such as Cathay Pacific and JAL. 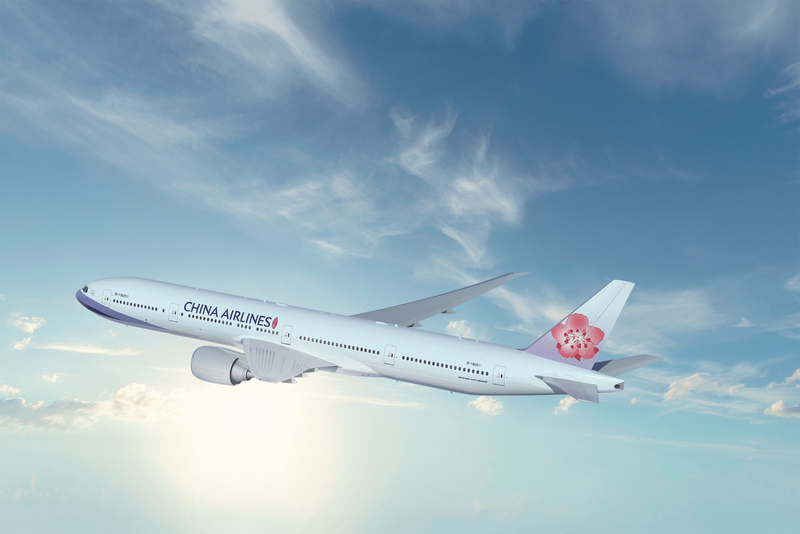 The exciting bit, is this isn’t just about a small fleet of 777s, the airline is also investing into improving the ‘on the ground’ product too, including updated lounges, food and IFE offerings. We are hoping to experience the whole 777 in the next few weeks, and will bring a report to you shortly afterwards. Stay tuned!